[WILLIAM K. VANDERBILT]. Partially Printed Document Signed. 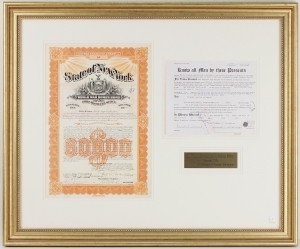 $50,000 World War Bonus Bond, issued to William K. Vanderbilt, Harold S. Vanderbilt, and Frederick W. Vanderbilt as trustees for Anna H. Vanderbilt, signed by first two. Certificate #64, with engraved vignette of the state seal. October 16, 1944. These state bonds financed “the payment of bonuses to honorably discharged Soldiers, Sailors and Marines of the World War, who were actual residents of the State at the time of their enlistment.” The bonuses had been used as inducements to encourage enlistments upon America’s entry into the First World War. Commodore Cornelius Vanderbilt had built a vast fortune in railroads, which his numerous heirs, to varying degrees, managed to squander on extravagant pursuits. Great-grandsons William Kissam Vanderbilt, Jr. (1878-1944) and Harold S. Vanderbilt (1884-1970) did manage to distinguish themselves as sportsmen. William built the first motor parkway on Long Island for use as a race course and toll road; it lost money and eventually was subsumed into the Long Island Expressway. Harold won yachting’s America’s Cup three times, in 1930, 1934, and 1938. He is also credited with inventing and perfecting the game of Contract Bridge.